The ANSWER Coalition has endorsed the "Five Days for the Five" taking place in Washington, D.C., May 30-June 5. Below please find a message issued by the the National Committee to Free the Cuban Five. Following that, please find the full list of events. As the Cuban Five approach 15 years of unjust imprisonment, supporters from across the world will converge on Washington, D.C. in late May for a week-long series of events called "Five Days for the Five." We urge all supporters to join us there, and add your voices to the call to Free the Five, along with Angela Davis, longtime activist and scholar; Miguel D'Escoto, former Foreign Minister of Nicaragua, President of the 63rd UN General Assembly 2008-09; Ignacio Raimonet, journalist based in France, editor-in-Chief of Le Monde Diplomatique 1991-2008; Dolores Huerta, co founder of the United Farm Workers (UFW); Fernando Morais, former Brazilian parliamentarian, author of best seller "Olga" and "The Last Soldiers of the Cold War"; Danny Glover, actor and activist; Rev. Joan Brown Campbell, former General Secretary of the National Council of Churches USA; María Leon, former Minister of Women Affairs, National Assembly delegate of the Bolivarian Republic of Venezuela; Saul Landau, filmmaker and author; Martin Garbus, U.S. lawyer and member of the legal team of the Cuban Five; Wayne Smith, former Chief of the U.S. Interests Section in Cuba, and many others. There are several public events during the week, the most important will be a rally in front of the White House on Saturday, June 1. 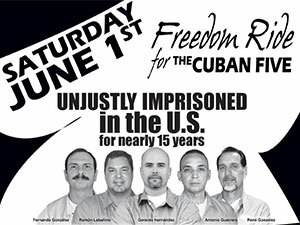 Groups in New York City are organizing "Freedom Ride for the Cuban Five" buses to bring people to the event - for more information call 347-201-3728 (9am-5pm) or the Freedom Ride Hotline 718-676-0106. Other events scheduled include a press conference, a cultural evening, hip-hop concert, lobbying, panel discussions, new books on the Five, and a videoconference to connect with families of the Five. The complete schedule of events can be found on our calendar. 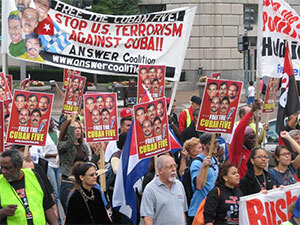 "Five Days for the Five" was initiated by the International Committee to Free the Cuban Five and has been endorsed by numerous groups including the National Network on Cuba, the National Lawyers Guild, the ANSWER Coalition, the National Committee to Free the Cuban Five, the Popular Education Project to Free the Cuban 5, and the July 26 Coalition (NY). To add your organization's endorsement, email apoyojornada@gmail.com. Contact us at info@freethefive.org or by phone at 415-821-6545 if you want to learn more or get involved. 9:00am: Press Conference. Wayne Smith, Dolores Huerta, Ignacio Ramonet, Yeidckol Polevnsky, and Sofia Clark D’Escoto, lawyers and other guests. Place: National Press Club, 529 14th Street NW, 13th Floor, Bloomberg Room, Washington, DC. 9:30am-5:00pm: Booth with information about the Cuban 5 at the Latin American Studies Association (LASA) conference. Place: Washington Marriott Wardman Park, 2660 Woodley Road NW, Washington, DC. 5:00pm: Important orientation meeting: Place: Howard University Hospital 2041 Georgia Ave NW, Ambulatory Care Center/Towers Building, Auditorium, First Floor, Washington, DC 20060, (There is parking in back of the hospital and also an entrance off of 5th street, between Elm and V streets.) The orientation will be followed by the 7pm meeting at the same location. 9:30am – 5:00pm: Booth with information about the Cuban 5 at the Latin American Studies Association (LASA) conference. Place: Washington Marriott Wardman Park, 2660 Woodley Road NW, Washington, DC. 10:00am – 5:00pm: Washington area outreach. Pick up literature and assignments for distributions at busy Metro stops and other public places. Place: Institute for Policy Studies, 1112 16th St. NW, Suite 600, Washington, DC. 1:00pm: Rally in front of the White House, across the street from Lafayette Park. Activists are coming from Quebec and many U.S. cities, including a large delegation of Cuban Americans from Miami. The June 1st Organizing Committee based in New York City is organizing buses to join the DC rally. Tickets are $5 roundtrip with lunch included. Buses will be leaving from the Bronx (Hostos Community College), El Barrio/East Harlem (Julia de Burgos Cultural Center), Washington Heights (Port Authority Bus Terminal/179 Street & Broadway) and from D.C. 37-Local 372 and the Martin Luther King, Jr. Labor Center/1199-SEIU, Manhattan. To reserve your seat from NYC, call 347-201-3728. Rally Program will include speakers representing diverse voices from the struggle to free the Cuban 5 from the U.S. and abroad, plus entertainment. 6:00pm: Ecumenical-Cultural Event. Special Guests: Angela Davis, Nacyra Gómez Cruz, Presbyterian Reformed Church in Cuba, Secretary of International Relations of the Christian Conference for Peace for Latin America and the Caribbean, Yeidckol Polevensky (former Vice President of the Mexican Senate), Maria Leon (from the Venezuela National Assembly) Sofia Clark D’Escoto (former First Secretary of the Nicaraguan Embassy in Washington DC). Poetry by Andy de la Tour, English actor and screenwriter. Music by Mighty Gabby, a Cultural Ambassador for the island of Barbados who sings Calypso and the DC Labor Chorus. Place: Saint Stephen Church, 1525 Newton St. NW, Washington DC. 11:00am: Community Event. Gathering at 11am in downtown Takoma Park (between Carol Ave and Laurel) to walk back to Place: Casa Rutilio, 102 Park Ave, for a community event at 1:00pm. This event is organized by the Takoma Park Free the Cuban 5 Committee and endorsed by the DC Metro Coalition to Free the Five and the International Committee for the Freedom of the Cuban 5. Music by Ismael “Bandolero” Duran and Patricio Zamorano. 9:00am: Lobby activities. Members of Parliaments from other countries who have confirmed their participation: Gianni Vattimo, (Italy), Yeidckol Polevensky (former Vice President of the Mexican Senate), Heike Hänsel (Germany), Hugo Gutierrez and Alejandro Navarro (Chile), Werner Marroquin (El Salvador), and others to be confirmed. 11:00am: Meeting with attorneys and jurists from the U.S. and abroad. Convened by Martin Garbus, attorney of the legal team of the Cuban 5 with the presence of lawyers from the U.S. and abroad including former U.S. Attorney General Ramsey Clark, Peter Schey from the Center for Human Rights and Constitutional Law, Jose Pertierra, Attorney representing Venezuela in the case of the extradition of Luis Posada Carriles to Venezuela, Rafael Anglada from Puerto Rico, Fabio Marcelli and Tecla Faranda from Italy, Beinusz Szmukler from Argentina, Graciela Rosemblum President of the Argentinean Human Rights League, and many others. Sponsored by the National Lawyers Guild. Place: Georgetown Legal Center, 600 New Jersey Avenue, N.W., Washington, D.C.
6:00pm: Meeting of elected union leaders and rank and file members from the U.S. and abroad. Welcome from Dena Briscoe, President, American Postal Workers Union Local 140. Special guests: Dennis Lemelin, National President, Canadian Union of Postal Workers, Santos Crespo, President, Local 372 New York City Board of Education and more. Find out why unions in Canada, Ireland and Britain support freedom for the Cuban 5 and how the movement is building in the U.S. Place: Postal Workers Union Hall, 6139 Chillum Place NE, Washington, D.C. 20011. 7:00pm: Opening of an art exhibit of new paintings by Antonio Guerrero followed by a panel of intellectuals. This exhibit is comprised of 15 new paintings by Antonio Guerrero reflecting the 17 months the Cuban 5 spent in the “Hole” and will be introduced by by Gilbert Brownstone, artist, curator, collector and philanthropist. The panel will discuss Cuba in contemporary times and will include Ignacio Ramonet, Spanish writer and former editor-in-chief of Le Monde Diplomatique, Jane Franklin, author, historian and expert on Cuba-U.S. relations, Gianni Vattimo, well-known Italian philosopher, and member of the European Parliament, Miguel Barnet, writer and current President of the National Union of Artists and Writers of Cuba (UNEAC) and Salim Lamrani, French professor, author and researcher. Place: Busboys and Poets, 2021 14th Street, NW. 9:00am: Last day of Lobby Activities. 5:00pm: The 5th for the Cuban 5 closing event: An art exhibit of a motorcycle journey throughout Latin America by graduates from the Latin American School of Medicine in Cuba that promoted awareness about the Cuban Five. Plenary Session with organizers from the U.S. and abroad discussing work and future actions is support of the struggle to free the Cuban 5. Music by Mighty Gabby. Place: Embassy of the Bolivarian Republic of Venezuela- Bolivarian Hall, 2443 Massachusetts Avenue, NW, Washington, DC.